Dr. Frances Kendall will be lecturing on "White People’s Right to Be Wrong and Still Be Right" at an Indiana University campus. Dr. Kendall -- a white woman -- is so dedicated to the talk, which focuses on "whiteness" and "white supremacy," that she will be presenting it separately to white faculty and students before presenting to the faculty and students "of color." Shrug. As long as parents continue to waste their tuition dollars on shitholes like this, we can expect it to continue. A racial controversy has erupted tonight over the discovery of a 35 year old photo of Governor Ralph Northam either dressed as a Klansman or a black faced white. Of course the photo is abhorrent but I believe the motivation for its release is to dump Northam to end the controversy over his infanticide position which has motivated more anti abortion sentiment than anything I can remember. This racializing everything has got to stop. Dr. Frances Kendall is a nutbar if she thinks this is helpful to anyone. Woodrow Wilson would be so proud ! Perhaps the Professor is channeling ole Woodie, typical racist Demikrat . . .
“Upon taking power in 1912 Washington, Wilson and the many other Southerners he brought into his cabinet were disturbed at the way the federal government went about its own business. One legacy of post-Civil War Republican ascendancy was that Washington’s large black populace had access to federal jobs, and worked with whites in largely integrated circumstances. Wilson’s cabinet put an end to that, bringing Jim Crow to Washington. Wilson allowed various officials to segregate the toilets, cafeterias, and work areas of their departments”. So Wilson actually reversed more tolerant policies put in place by Republicans. Leftists like to portray Wilson as a visionary. They neglect to mention that the future he envisioned was a racially segregated one. How about this…. Give everyone a loaded gun, and put them all in one room together. Start the discussion… We already know who will survive… Old Dr. Kendall will be the first one to go. BOOM, one down…. Darwin figured it out a long time ago.. No need for Semi-Autos… Give everyone a .357 magnum Revolver. Problem solved. Just one shot needed….Then, the rest of us can get on with our lives…. No need to thank me. You’re welcome…. It is obvious that the white people will be lectured at how evil they are for the whole lecture and those with coloured skin will be portrayed at victims of those “evil” white people. Why would any white self-respecting student attend such a lecture. Wonder what the people who risked life and limb fighting for equal rights against the Democratic Machine during the 50s and 60s would think? 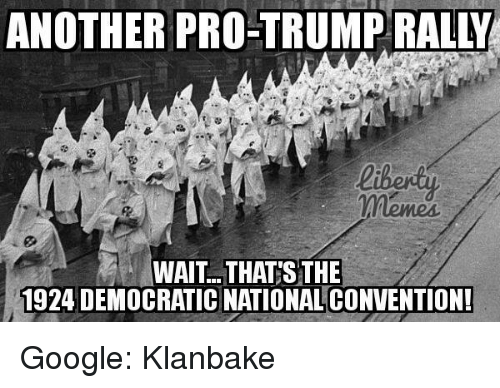 Seeing their children and grand children willing returning to the democrats segregation plantation? Perfect example of a Lie by Omission typical of modern liberals. Hey Al! Do you mean you watched Bull Connor, THE DEMOCRAT? Is that the Bull Connor you watched turn hoses on civil rights demonstrators? What’s that? You heard a lot of racist comments when you were young, Al? Were they from the mouth of your dad, Al Gore, Sr.? After a quick Google search, I found out that Al Gore, Sr. voted against the Civil Rights Act of 1964 when he was a Democratic U.S. Senator from Tennessee. Not only did he vote against it, he participated in a 74 day filibuster in an attempt to delay and weaken the legislation.